Many visitors ask us to explain the presence of so many Russian yachts on the French Riviera. Trying to answer it, we propose to go back to the archives of Villefranche, where many inhabitants evoke with nostalgia the presence of a "naval base" in Nice county which sheltered the imperial fleet of the Czar more than 160 years ago. Then we suggest a parallelism with the contemporary period. After the Crimean War, the Russian Navy is forced to dismantle its bases of the Black Sea. But Russia wants to maintain its influence especially with respect to its ties in the Balkans and Orthodox Greece. Thus the Tsar obtained the signature of a lease with the Kingdom of Savoy in 1858, to settle in the harbor of Villefranche. It was just 160 years ago! Another major change for the Imperial Navy after the defeat of Crimea was to catch up on the technical lag by switching from sailing navy to steam navy. Two years after signing the lease, the County of Nice became French. The lease is extended by Napoleon III who has good personal relations with the Czar. Finally, at the fall of the second empire, the French Third Republic extends the lease too. Thus, for nearly 10 years, it has been almost always 3 to 5 Russian ships that anchor in the Bay of Villefranche. It was not until 1884 that the "naval base" was definitely closed. Indeed, the Tsar finds full access to the ports of Sebastopol and Odessa with the help of his Prussian allies. Moreover at this time the Russian Navy wishes to become the 3rd world maritime power after England and France. Many ships will be built in Western Europe in order to enhance the Russian naval industry quickly. There was no longer any military interest in maintaining premises in Villefranche. The facilities are being transformed by Russia into an oceanographic institute. It will be necessary to wait until 1937 so that the laboratoire océanographique de Villefranche is finally attached - and financed - by France. Today the Russian Navy still has access to the Eastern Mediterranean with the Syrian port of Tartous. The presence of the Russian fleet at Villefranche has made it possible to forge numerous relations between the French admiralty based in Toulon and the Russian admiralty based in Kronstadt, in the suburbs of Saint Petersburg. The establishment of coal storage buildings, food and a hospital for seafarers was particularly appreciated by the local populations who benefited from this economic contribution. Not far from there, the entourage of the Tsar came to stay many months in Nice or Villefranche to celebrate sumptuous feasts with the notables and also doing works of charity. 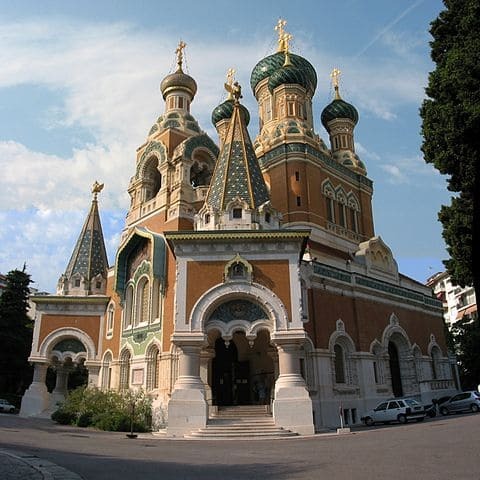 At the same time, the Russian community of Nice will build Orthodox churches, including the magnificent Orthodox cathedral, which is considered the most beautiful outside Russia. Nice will also inherit many sumptuous villas such as Château Valerose acquired in 1867 by Paul Grigorievich baron von Derwies. All the students of Nice know this castle, because it will be returned by Nice to his university in 1950. There is no longer a Russian navy in the Western Mediterranean, but it is tempting to make the parallelism between the presence of super-yachts and the Russian influence on the Côte d'Azur. Is the Sailing Yacht A a reminiscent of the Russian imperial navy of the early nineteenth century? Many of the largest yachts in the world are owned by Russians and have been built in Western European shipyards as before. The most famous of the Riviera heartland are the Sailing Yachts A, the yacht A, the Blade, the Eclipse, the Grand Bleu or the Dilbard. These yachts contribute to the economic activity of the coastline while mooring, for example in the bay of Saint-Jean-Cap-Ferrat, entre Nice et Monaco. It is certain that these yachts still represent a tool of influence. They welcome distinguished guests who particularly appreciate the Côte d'Azur for its setting and its particular history that we have just presented. Would you like to enjoy the views of the coast from the sea like the Russians? Good news, it is not necessary to be enlisted in the Russian Navy, one of the hardest in the world at the time of the Tsar. It is not necessary either to be invited on a yacht, because rare are the elected ones. Would you also imagine that you can take a boat trip while being admired as long you are aboard? Indeed, you will sail on a motor catamaran propelled 100% by the energy of the sun which glides silently and odorless. In advance of all the world's navies, SeaZen is recognized as one of the 1000 Efficient Solutions in the world by the Solar Impulse Foundation. It takes just one hour to leave Beaulieu-sur-Mer to soak up the French Riviera. During this tour accompanied with a guide, you can contemplate the beautiful villas of the Riviera's heartland. The booking can be made online and the service is open all year depending on the weather.